With Spring upon us, now's the ideal time to visit a slice of a paradise. Home to only 400 people at any given time, Lord Howe Island remains one of Australia’s best kept secrets. Few holiday destinations on the Southern Hemisphere can rival the natural beauty that Lord Howe Island brings to the table. There's a myth that Lord Howe Island is hard to get to. Lord Howe Island lies approximately 600km northeast of Sydney. 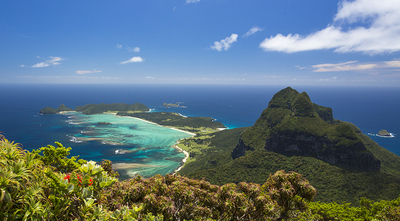 Qantas offers flights to Lord Howe year-round. Air's probably the best way to get there outside of sailing there on your own yacht. Once there, you'll be spoilt for choice in terms of things to do. Witness the beautiful red tailed tropic birds perfrom their courting rituals from Malabar Hill, enjoy a bushwalk through the Valley of Shadows or feed fish straight from your hands on Ned's Beach. 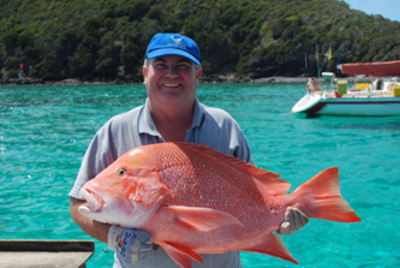 Fish at any one of Lord Howe's untouched fishing spots. Adventures await in the water of Lord Howe Island. Head on over to Blinky Beach or as the locals have dubbed it ‘Champagne Surf’ and enjoy the waves. Diving at Lord Howe Island is an experience that can't be replicated anywhere else. The island is located at the crossroads of five major ocean currents.This unique location is a sanctuary of rare marine life like the beautiful Ballina Angel fish. There are over 60 world class dive sites on the island alone. What are you waiting for? All you have to do is book your flight (or purchase a yacht), arrange accommodation and you'll be ready for your slice of paradise.